Msgr. John Edward Morris, M.M. Click on the picture to open or save it. The Sisters of Our Lady of Perpetual Help(SOLPH) was founded in 1932 on the 27th of June, the Feast Day of Our Lady of Perpetual Help. It was Msgr. 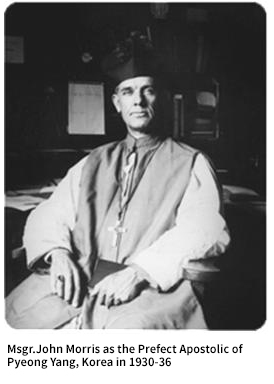 John Morris, a Maryknoll missionary and the 2nd Apostolic Prefect of Pyongyang Diocese, who founded our congregation in Pyongyang, North Korea. Through the light of the Holy Spirit, Msgr. Morris joined in union with the original intention of the ladies who wanted to devote their lives to God and the Church. The Maryknoll Sisters helped in the initial formation. In 1940, eleven new sisters were able to make their first vows and sent to parishes and schools to begin their missionary works. Not long after this joyful state, the effects of World War II forced sisters to be separated from the Maryknoll sisters. Although the Koreans were liberated from the Japanese colony in 1945, the sisters underwent another hardship of the Russian armies who occupied the north. The congregation was temporarily dispersed on May 14, 1950. yet, Sisters did not lose hope of reassemble again soon. Shortly after the breakup of the war, the sisters rejoined together migrating south and settled in Pusan. On the 8th of December, 1951, the sisters started to novitiate in the south and they were able to reestablish the Generalate in Jeongnueng, Seoul, 1964. The Congregation contued to grow and on December 8, 2001, the congregation transitioned from the diocesan right to a pontifical right and have nearly 600 members serving in Korea, Peru, the Philippines, the United States, and Kazakhstan. The Sisters of Our Lady of Perpetual Help, try to evangelize ourselves first before spreading the good news of Jesus Christ. We then serve the people according to the purpose and foundations of our mission.